GIFs are a lot of fun, but they also serve another purpose. Because they are animated, they can communicate a lot more than a static image, and sometimes a GIF works even better than a video. They “play” automatically on the page, and the constant animation creates a mood. Cinemagraphs, for example, can look extremely elegant and sophisticated, and have nothing in common with memes, apart from the same file format (but don’t get us wrong, we like memes too. Quite a lot, in fact). GIFs are extremely versatile, and they can bring added value in your marketing materials. So why not bring GIFs into your catalogs? Now you can! We listened to your suggestions and we're happy to introduce our new supported format, GIF. Click here to see the entire flipbook. You don’t want GIFs to be an afterthought in your catalog or flipbook. If you have a PDF that you want to turn into a digital catalog, you should know already what GIF you want to use and where you want to place it. We recommend planning ahead and saving a placement in your PDF design especially for the GIF, by adding a placeholder shape or a static image. If you are designing your catalog in Flipsnack, you have more flexibility. You can keep re-arranging page elements and move the GIF around on the page in our online Design Studio, until you are happy with the overall layout. You have to remember that with GIFs, a little goes a long way. We recommend using just 1 GIF/ layout. If you add more, the animation can become overbearing and extremely annoying. If there’s subtle movement in your GIF, it will not distract readers from the text. If you have strong movement in your GIF, consider integrating it in your design in a way that is not distracting for the reader. You may have uploaded a PDF to create your digital catalog, or maybe you designed it in Flipsnack. Either way, you have to find the Design Studio because that’s where the magic happens. Adding a GIF is just as easy as adding an image, and it works exactly the same way. 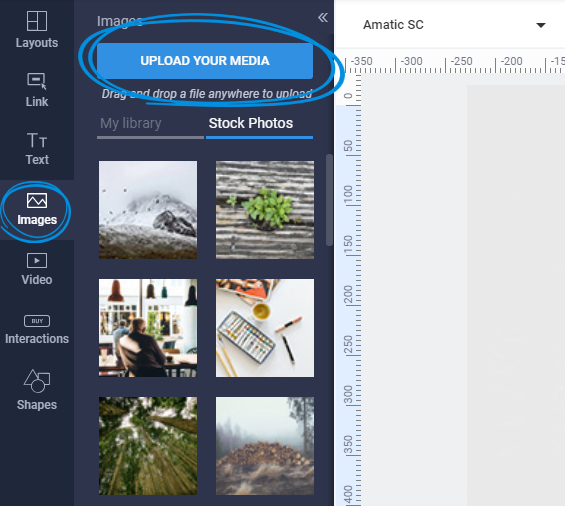 To add a GIF, JPG and PNG image, click on the Images tab on the left side of the editor, then click Upload your images and double click on the GIF you want to add to your library. Once the GIF is in your library, just drag and drop it on the page. It’s literally that easy! Now it’s your turn to use your creativity to add GIFs in your flipbook design. Have fun! We can’t wait to see the results.